Born in Canada in 1891, Bernice won the Canadian Rodeo Champion High Jump contest in 1911, setting a new record, on a borrowed cowpony. 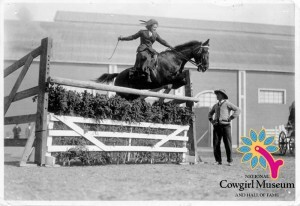 She was a natural horsewoman, winning numerous jumping contests and relay races. Raised doing ranch work, she and her husband homesteaded in New Mexico, and upon his death Bernice managed to keep the ranch, despite challenges to her citizenship status, and increase its size and success.